In industrial control applications, the plants are often represented by integer-order models and controlled by proportional-integral-derivative controllers. The control scheme for permanent magnet synchronous motors (PMSM) includes two nested loops, each employing a PI controller: the inner loop is dedicated to control the current, the outer loop is devoted to control the angular speed. The optimum modulus and symmetrical optimum criteria are widely accepted techniques to tune the two PI controllers. 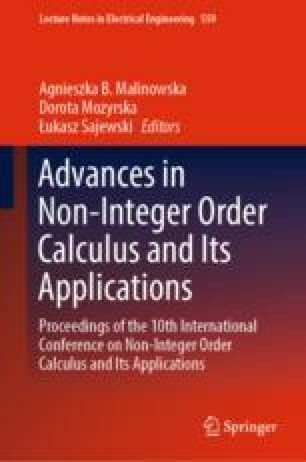 However, to obtain improvements, one may think to apply non-integer order controllers. To this aim, if one uses a fractional-order PI (FOPI) controller in the inner loop, the consequent inner feedback system of non-integer order becomes a non-integer order plant in the outer loop. Then, a FOPI controller should be more effective to control a real example of non-integer order plant. This paper proposes an appropriate design approach to obtain performance and robustness specifications by FOPI controllers in both loops. The approach provides analytical formulas to determine the parameters of the controllers, which are characterized by stability, minimum-phase and interlacing properties. The simulation of a real PMSM shows the effectiveness of the approach and could help to increase the confidence in non-integer order controllers. This paper is based upon work from COST Action CA15225, a network supported by COST (European Cooperation in Science and Technology).